On Sunday, April 30th 2017, Oprah Winfrey, probably America’s best known talk show host, sat down for that day’s episode of her weekly talk series SuperSoul Sunday. She met Geneen Roth, author of several self-help books on eating, dieting and women’s spiritual life. Geneen and Oprah talked about a topic seemingly accompanying both middle-aged women for almost their whole lifetime, their long lasting “struggles” with food, dieting and their body—leading to life-changing insights Roth digested in her best-selling book “Women, Food and God.” I will, first, explore that show as a gateway to think about how food and body are dealt with in popular media. The show stands as a powerful example for how food and eating have become an issue of modern American spiritual thought. Second, I will depart from there to think about how pleasure, dressed in historically variable characteristics, operates as a mediating concept within a greater circle of discourses about health, body or self-fulfillment in modern American society. Presented in a pleasing, earthly colored ambience, almost short to exaggerated, SuperSoul Sunday’s setting immediately opens the stage for the issues discussed in Geneen Roth’s guidebook—one’s individual relationship to food, eating and body as a spiritual issue. The author dedicated her work in books, articles and workshops to compulsive eating, eating disorders and primarily white middle-class and mostly middle-aged women’s struggles with bodily self-perception or mental issues. During the interview an almost gospel-like message in a quite affirmative voice and intense spiritually charged rhetoric puts forward the assumption that conscious food choice and mindful eating patterns are “the doorway” to understand where further reaching problems in people’s life come from. With regard to actual dietary advice “Women, Food and God” comes along studded with truisms like ‘stop eating when you’re full’ or ‘think about what food is good for you’, additionally coated with notions of self-reflection and spirituality. The show emphasizes phrases like ‘be kind to yourself’ or ‘always search the holy moment within the everyday’ that it almost seems disconcerting. The theme of personal enjoyment in food is lifted up to spiritual fulfillment and an almost lifesaving experience—given that one does ‘eat right.’ To underline that, Roth brings in her own life story in a very emotional way. Having suffered from financial bankruptcy and revealing herself as “several times in fact suicidal,” she emphasizes how her troubled and finally spiritually induced negotiations with herself had helped her to become one with her body and discover a ‘healthy’ relationship to food. She strongly connects food with an alleged individual responsibility for bodily health and extents food’s nutritional and vital function by a strongly spiritual, almost transcendental one. That ‘right way’ of eating merges with an affirmation to seek enjoyment and pleasure in eating besides thinking about nutrition and the possible effects on one’s waste line—what, according to Roth, becomes obsolete anyway if one takes to heart her insights. But pleasure is not detached from being something transgressive, something to suppress, something intrinsically connected to guilt. Although ‘bad’ foods or habits in the shape of one’s “ghost children”, a term coined by Roth, might lure everywhere, pleasure rather is assumed as something that could be strategically mastered and applied for a better and happier life by identifying positive stimuli in eating. 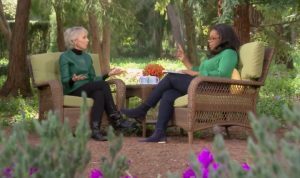 As to emphasize that, Oprah leans forward, talking almost directly to the camera about eating ice cream although “doing the Weight Watchers thing,” and passionately states: “I eat it slowly, intentionally and deliberately and I enjoy every spoonful until I no longer feel that sensation of pleasure!”—and then she stops. Apparently, it lies in one’s personal ability to eat wisely and consciously and to enjoy food, life and spiritual happiness! Such a rhetoric of personal empowerment is not new, neither to Oprah viewers nor to one who pays attention to the entangled histories of food, health and notions of pleasure within modernity. Oprah Winfrey’s on-screen performances, her impact as a “cultural icon” on American society as well as her numerous remarks on food, diet and body relationship as part of her own biography have already been subject to several analyses of media and also feminist studies. Trysh Travis analyzed Winfrey’s very successful Oprah’s Book Club. The anthology of books recommended in the Book Club often included advice literature next to fiction. Books similar to Geneen Roth’s introduced spiritual self-fulfillment as achievable by everyone, if only one discovers his or (mostly) her own ‘true’ personality and comes at balance with it. Such a coherence, however, is not just the résumé of recent observations, but can be historically embedded. Travis compared this Oprah phenomenon to ideals of New Thought; religious ideas rooted in turn-of-the-century America and its wide array of forms of spiritual awakening, which have received new and increased attention since the 1960s. New Thought is heavily loaded with transcendent spirituality and a language of individual empowerment to discover one’s true ‘spiritual self’ within the own body, seen as the essence of God in the material world. The almost mantra-like notion of empowerment through a ‘right handling’ of food in our SuperSoul Sunday-episode gives room for that interpretation, too. Furthermore, one can also take it as a point of departure to look closer at how food and eating have become part of neoliberal ideas about healthy bodies, fitness, responsibility and proper lifestyle in general. Both Geneen Roth’s advice manual and Oprah Winfrey’s New Thought-inspired habitus symbolize a twenty-first-century tip of the iceberg of how to deal with desire and responsibility when it comes to food, health and bodies in relation to pleasure, leisure and fulfilling individual life plans. In American history a certain understanding of a dynamic concept of fitness has become intensely interconnected with ideal concepts of how American society should work. Everybody is constantly encouraged to prove his or her ability to be a productive and responsible member of a liberal society that at the same time provides its members with certain liberties and calls on them to pursue individual happiness. Implied is the challenge to balance responsibility and desire, work and leisure, and also pleasure in eating and working out for a healthy body. Likewise, ‘eating right’ in America and producing nutritional knowledge has a long tradition. Exploring nutritional thought in modern history helps to understand how food and normative assumptions about eating behavior have become essential aspects of how subjects are called upon to take care of themselves, similar to the ever increasing significance of fitness and exercise. Looking closer into medial representations of food topics throughout the 20th and 21st centuries, however, a lot seems to revolve about a vibrant notion of desire for pleasure, leisure and making the best out of one’s time, budget or calorie range. In e.g. cookbooks, (women’s) magazines or TV shows food and a bagful of related practices like cooking, shopping, eating-out or entertaining seem to be embedded into an all-embracing striving for pleasure. Pleasure is a powerful topic in our relationship with food and eating, while the ideal flagship of a well-governed modern social order seem to be good health, fitness and individual responsibility. Similar to other aspects of modern life, a historicizing perspective helps to clarify this ambiguity. Looking at the 1960s onwards, widespread formal dietary advice and rather popular media representations of food topics are far apart from each other with regard to pleasure. Pleasurable eating is hardly a topic for nutrition, ingredient and calorie focused guidance. Adelle Davis’ writing, in 1972 cited by Time magazine as the “high-priestess of nutrition,” stands for dietary advice that mostly rejects personal pleasure in eating. In “Let’s Eat Right to Keep Fit” written in the 1950s but successfully re-issued in the 1970s, ‘eat what is good for you, not what you like’ worked as the credo. In contrast to that, food topics, shopping tips and recipes or even diet descriptions within women’s magazines of the 1970s and 1980s recited an understanding of pleasure that contrasted with formal dietary guidelines, but nevertheless adapted to the appeals of liberalism. Women were always called upon to be wise decision makers concerning their time management, their budget, their calorie intake, and their families’ health. However, every suggestion for such wise decision making included the appeal that besides personal wellbeing, it was utterly important to achieve and experience pleasure. Thus, the ‘right’ handling of pleasure is not a very recent phenomenon. To conclude, a notion of attainability of a ‘right sort’ of pleasure in eating has to be seen as embedded into discourses on health, fitness, ‘eating right’ or even spirituality. As both the discussion of “Women, Food and God” and food topics from the 1950s onwards show, at the bottom line, a strong need of mainstream food consumers to frame the aspiration to ‘eat right’ with some aspects of pleasurable experience becomes obvious. Furthermore, the common crucial point is, that pleasure functions as a kind of regulative ideal comparable to fitness or ‘eating right’. Pleasurable eating is not meant to be repressed or avoided, but rather to be adapted to society’s invocations of the responsible self. Not just in relation to food pleasure has become an inevitable factor liberal subjects have to cope with. This entry was posted in Body Politics, Diet Practices, Food Writing, Media Culture and tagged calories, choice, media, neoliberalism, responsibilization, weight loss dieting. Bookmark the permalink. Stefanie Büttner works at the Department of History at the University of Erfurt as a research assistant in the field of North American History. 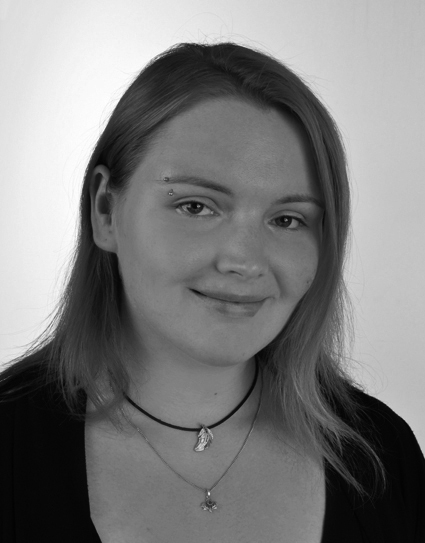 As part of the joint research project “Nutrition, Health, and Modern Society: Germany and the US.” she is currently working on her PhD thesis on a history of pleasure in the 1970s and 1980s US in relation to diet and health. Her research interests include U.S. cultural history (19th and 20th century), food history, history of leisure, governmentality and biopolitics as well as spatial theory.